The Casillion Casino website is one of the most user friendly casino sites we have come across. It is ideal for Beginners as there is nothing complicated and everything is clearly laid out, including all the games which don't require miles of scrolling to locate the one you want to play. The site is also fully mobile compatible so can be played via Desktop or your mobile device. No Download of the software is required as the games are played in your browser. Although Deposits are processed in Euro's - UK Players are Welcome at Casillion Casino. Your first deposit is matched with a 100% bonus up to 100€. Your second deposit is matched with a 30% bonus up to 300€. Your third deposit is matched with a 30% bonus up to 300€. Your fourth deposit is matched with a 30% bonus up to 300€. The Playthrough requirement for the 1st deposit is 32x the deposit and bonus received, and the playthrough requirement for all additional deposits is 18x the deposit and bonus received. Please ensure that you manually choose your Bonus when making a deposit, as they are not credited automatically. Visa, MasterCard, Bank Transfer, paysafecard, Skrill, Neteller, ecoPayz and iDebit. 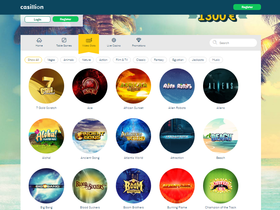 Casillion has a good selection of casino games from Microgaming, NetEnt,Evolution Gaming, Quickspin, Betsoft, Xplosive and GameArt. card game that uses a single deck of 52 cards, and is a game of chance between you and the Dealer. You are dealt two cards. If these cards are not a Pair or Consecutives, you need to guess whether the value of the third card will be between the values of the two cards dealt. If you guess correctly you are paid out according to the Pay out table. The Progressive jackpot is won when three of the same cards appear.